A delicate, fragrant combination of green tea and the jasmine plant, jasmine tea has historically been called a “gift from the divine” for its delicious taste and health benefits. 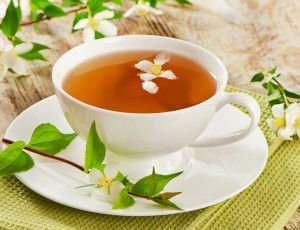 Drinking jasmine tea has been shown to reduce ‘bad cholesterol’ (LDL) and raise ‘good cholesterol’ (HDL) in the body. As high LDL levels are associated with heart disease and stroke, consuming jasmine tea can naturally reduce the chances of these conditions. If you want to slow down the effects of aging on your body, jasmine tea can help! The antioxidants in jasmine tea help combat free radicals, which are associated with the aging process. When left unchecked, free radicals circulate throughout the body and damage its cells. Drinking jasmine tea can help lessen this damage. Research has shown that people who drink green tea, which jasmine tea is made from, lose weight faster than people who don’t. This is because green tea contains catechins, which can increase a person’s metabolic rate, thus aiding in fat burning and weight loss. Research has also shown that jasmine can help relieve anxiety and stress. Inhaling the scent of jasmine has a sedative effect on nerve activity and mood and reduces heart rate. So make sure you smell while you sip! When you drink jasmine tea, you get the benefits of the jasmine plant and the green tea, both of which contain powerful cancer fighting properties. Green tea is high in antioxidants, which counter the free radicals in the body that can eventually lead to cancer. Meanwhile, the scent of jasmine is also thought to contain anti-cancer properties. Once again, be sure to sniff as you enjoy your cup of tea. Jasmine tea not only combats bad bacteria, it also helps our bodies to form good bacteria, which is very important for digestion and overall gut health. Having sufficient amounts of good bacteria in the gut can also help with conditions such as IBS and ulcers. Jasmine tea has both antiviral and antibacterial properties that help to prevent the development of colds and the flu. So whenever you feel sickness about to strike, drink up! Or, if you are already sick, drinking jasmine tea can help you to recover more quickly. Jasmine tea is linked to improved blood circulation. Therefore, it is thought to be able to prevent some medical conditions caused by or related to poor blood circulation, including blood clots, thrombosis, high blood pressure and strokes. Good health has rarely smelled so wonderful. Previous articleIs Relationship Stress Impacting Your Health? 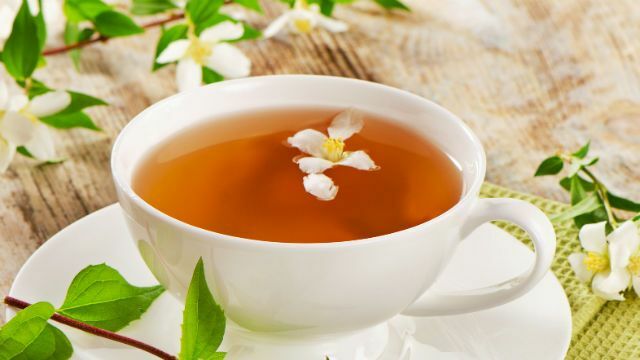 Hey Buddy!, I found this information for you: "8 Health Benefits of Jasmine Tea". Here is the website link: https://www.thealternativedaily.com/8-health-benefits-jasmine-tea/. Thank you.